This year the H13 – Lower Austria Prize for Performance was awarded to the artist Lilo Nein for the performance WAS UNS BEWEGT! [What Moves Us!]. 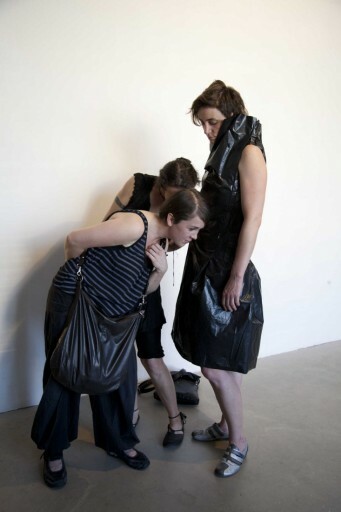 “Lilo Nein’s performances address the big problem of physical communication, in which artistic performance, too, is repeatedly caught up, namely the unavoidable relationship between the body and language.” This is how the artist Elisabeth von Samsonow, as a member of this year’s jury, explained the choice of the winning performance. Other jury members were the artist and curator Ursula Maria Probst and Christiane Krejs and Sissi Makovec (both from the Kunstraum Niederoesterreich). After previous prize-winners had focused on themes such as gender, ageism and other socio-political areas in their works, this year’s H13 winner has spent years analysing the essence of performance itself, both theoretically and practically. She examines the live act and our understanding of it in various respects. In her work the performance travels through different media; it is text, instruction, document, it is sung, it moves and communicates. Born in Vienna in 1980, the artist studied fine art in Vienna and Hamburg as well as choreography with deufert&plischke in Hamburg. From 2004, she made video works, multimedia and performative installations and performances. As a result of the analysis of the relationship between body and language as the constituent factor in the performance, there is an opening very early in Nein’s work and she begins to collaborate with performers as actors. Following this, text as a (language) expression independent of time becomes an important element of Nein’s definition of performance. For the publication SELBST ÜBERSETZEN! Ein Performance Lesebuch zum Aufführen [Translate Yourself! A Performance Reader for Staging] (2009) Lilo Nein invited 30 artists, choreographers and activists to write performances. These performance texts in book form address the role of writing and the written form in performance and the related detachment of the performance from a clear authorship as well as the uniqueness attached to a performance. With this Lilo Nein also questions the necessity of performance as a live act and the status of its originality. Through text, performance becomes repeatable, can be regenerated; the boundaries between the production, documentation and reception of performance become soft and permeable. In her 2001 publication DIE ANWESENDE AUTORIN: Wer spricht in der Performance? [The Present Author: Who Speaks in Performance?] Lilo Nein takes up the question of the authorship of performances even more decisively. By regarding watching as an active, indispensable activity, she underlines the interplay between production and reception, between the performer and the audience. 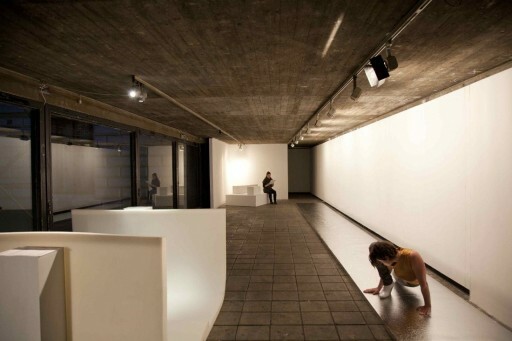 In a further step, Lilo Nein integrates the audience into her work; in her exhibition “To Insist on Performance” (2012), for example, she gets it to perform the text “A Discussion Between the Text and the Performance”. Lilo Nein’s work on the concept of performance takes place practically and theoretically. Her performance structures are frequently based on scores that as it were represent instructions for performative acting and improvisation. Her publications are on the one hand theoretical examinations of performance, and at the same time can be read as text performances. In the winning performance WAS UNS BEWEGT! too, Lilo Nein addresses the relationship between body and language, physical presence and text, the questions of the temporality and authorship of performance.